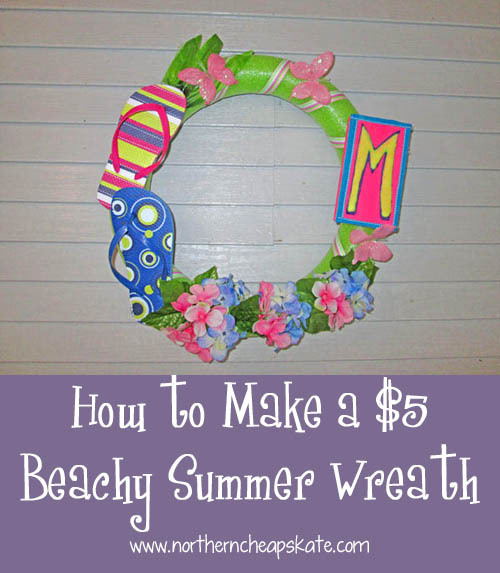 Continuing on my quest to try to bring summer to Minnesota when some days it seems resistant, I decided making a beachy summer wreath with an outdoor theme was in order. 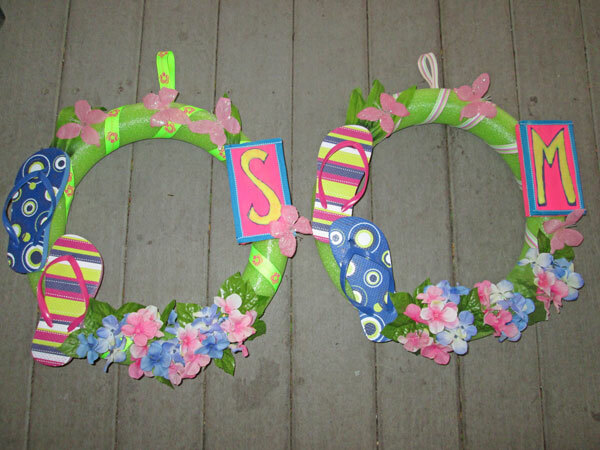 I wanted to mix up the colors of the flowers and vary the flip flop prints, so I decided to make 2 wreaths at a total cost of $10, making these $5 wreaths. A friend had just moved in to a new house and I thought she would love a touch of summer to brighten up her new front steps. From Michael’s, I purchased the neon pink acrylic paint and 2 spools of ribbon from the dollar bin. The rest of my supplies came from home, include scrap pieces of wood, hot glue, blue ribbon, a permanent marker, white glue, clear packing tape and colored sand. 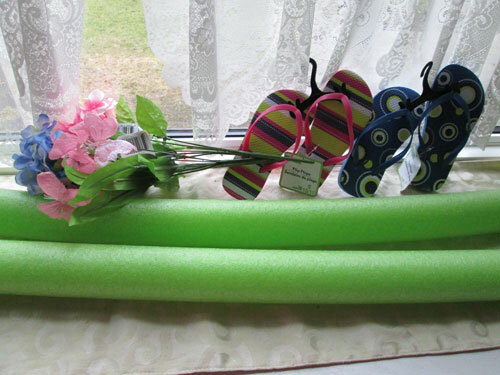 Directions: I created the base of the wreath by creating a circle from the pool noodle and taping the ends together. Next I painted the piece of scrap wood with the neon paint. When it was dry I drew on the outline of a letter. Next I filled in the letter with white glue and sprinkled colored sand over it. Finally I added more color by using some leftover blue ribbon and hot glued it to the edges of the wood plaque. Next I wrapped all but 6″ of a 9′ length of ribbon around the wreath form. I started and ended at where the wreath was joined and taped the ribbon in to place. Then I took apart the flowers and leaves. I took all the flip flops, flowers, leaves, butterflies and the wood plaque and arranged them on the wreath form. When I was happy with how they looked I hot glued every thing in to place. Finally, I used the 6″ of leftover ribbon and folded it to create a hanger that I attached to the back of the wreath with hot glue. This wreath has certainly brightened up the look of the front of our rustic cabin! Dollar tree is the perfect place to find items to make cute DIY projects. I may make one of these for my home. Even though I live in Florida it has been so rainy and depressing lately. My daughter would have fun making this! What a cute idea. My wife and daughter would have a blast making this..
What a cute idea. This would be great for a pool party. I actually decided to put ours at our rustic cabin up north and my friend decided to to hang her at her seasonal campground. A wreath with flip flops??? That is very cute and different. I love how they look with the flowers. It’s bright and cheerful and very summer like. Love the cost to make it. Can’t beat that. That is such a cute idea! And i love how it doesn’t cost a fortune to make. Best yet, all I need is the pool noodles & I’m set! Using a swimming noodle is genius!!!! This is such a cute idea and my girls would love making one of these! Great job! What a cute idea, I just love it. I want to make a themed wreath but I literally don’t have a creative bone in my body.